The mixed media works displayed on this page are diverse but have a thread of studio imagery. Much of the theme has to do with the kiln firing process and also the whim of the kiln, a feather as metaphor for putting work in the kiln and wondering how it will turn out. Dropping a feather or a leaf and not knowing where it will fall. Smoke from the kiln hiding our intent, or personal journey that we hope to keep private. Works are done on rag papers or board, some on clay board, with collage, graphite, gold leaf and actual objects feathers/ buttons applied. Installation pieces are stored in pieces and available for reinstall. 2012, Wood fired porcelain arms holding silk streamers printed with a smoke image. $!800. 2007, printed rag paper images of clouds forming a large hand with paper smoke trail. $800. 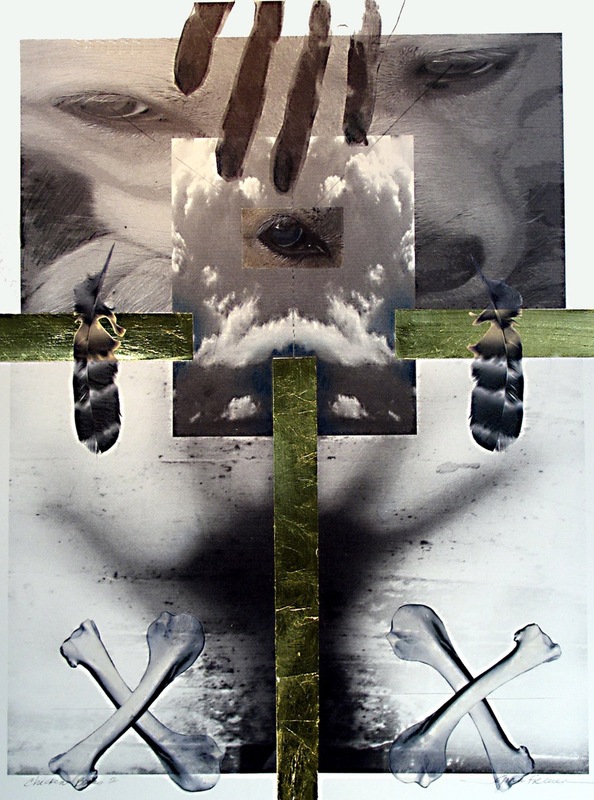 2005, Monoprint, collage, graphite, gold leaf, found object on rag paper, 24" x 30", $900. 2005, Monoprint, graphite, gold leaf, collage and found object. 24" x 30", $600. 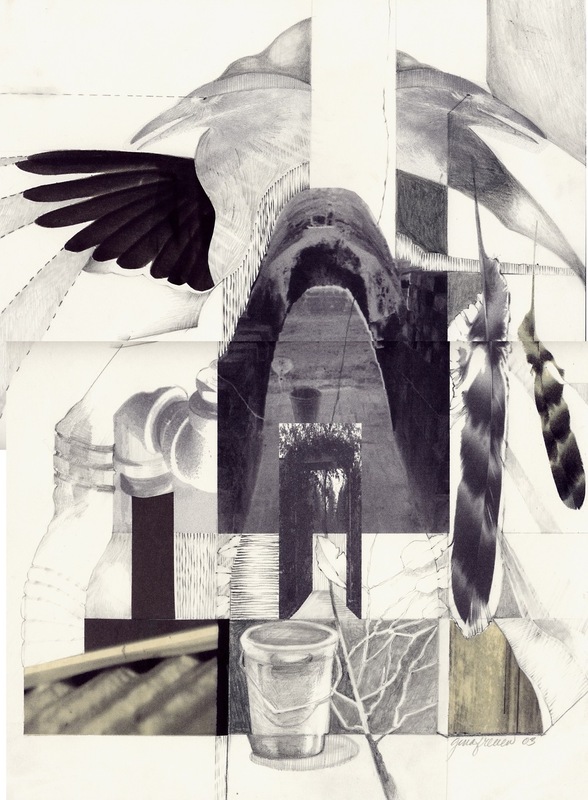 2003, Monoprint, collage, graphite and found object. 18" x 30", $900. 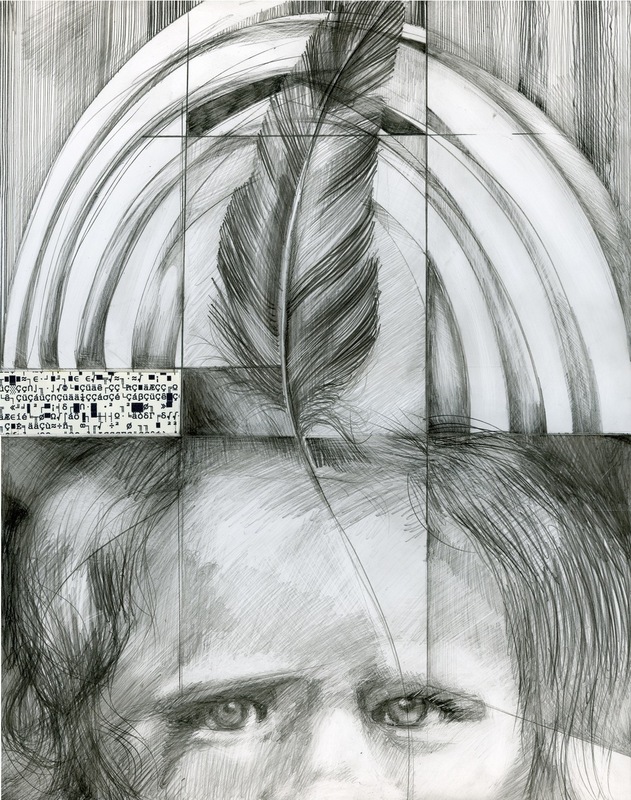 2003, Graphite and collage on Clay Board, 48" x 40", $2400. 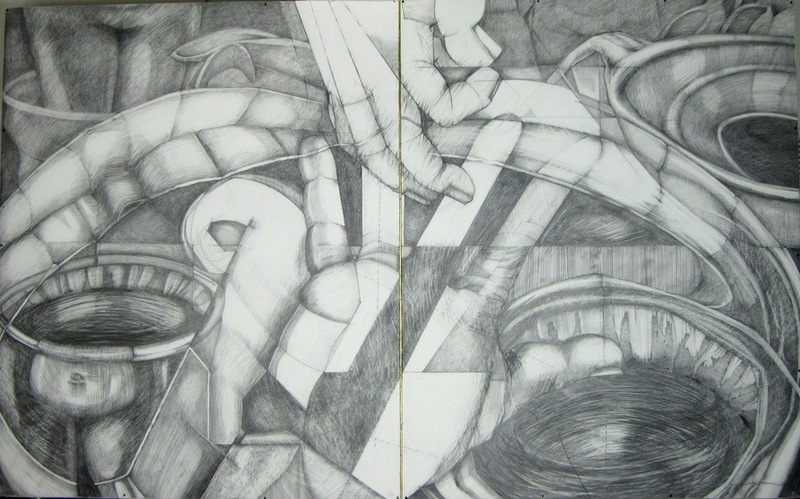 2012, Graphite on rag paper board, 40" tall x 64" wide x 1 1/2" deep, $1800. "Kiln Dog with Nest and Feathers"
2009, Graphite on Clay Board, 14" x 18", $350.